You can book your classes via the web portal – this is the screen that gets you in. You will need the email address assigned to your membership account. Your card is specific to you so don’t share the card number – you will need it to sign yourself in and book classes. You can login to your app store below. 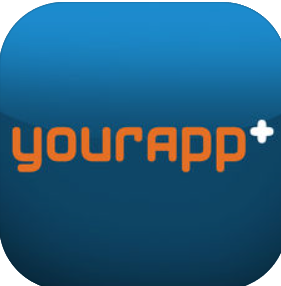 Download the app with the same badge as with the opposite ” YOURAPP+ ” logo. Downloading the app is the easiest way to book classes, talk to other members and track your workouts. All the classes on the timetable are instructor lead classes. We also offer 24/7 on-demand classes through our virtual terminal in the studio. We have all sorts of classes there when YOU need them the most. Turbo Kick is ran as a combat cardio type class. Aerobic classes pushing your confidence and fitness to new levels using combat type movements. You will be moving, kicking and punching for fitness. The mixture between movement Yoga, Pilates and Stretch and Flex. Move your body, build your core and then stretch your muscles giving you better blood flow and feeling. You will be relaxed and tired. Absolutions is based on a short quick abs blast. Young Guns is ours under 14yr class. The idea is that your kids can exercise and so can you. Child obesity is a major problem and we’re trying to combat this. Your Kids can pay per session, either turn up and see or book online. Aerobic workout, focus on your stomach while involved with movement and cardio based workout. Hitting your abs the day after the class. Designed to hit all of your body with muscle and toning exercises using the bar weights and plates to utilize your muscles. Burning class great for fat burning. You can work to your own pace. This is a low impact Legs, Bums and Tums. In the morning the class is for those that want to work at their own pace. The instructor will have alternative exercises for anyone who can’t do the full class. This is cycling to music with a Spin qualified instructor or equivalent allowing us to change the classes to hit your muscles harder or build strength more. Circuits are a full body workout working across the studio. Circuits can be inside or out depending on the weather and type of activities the instructor and members want to do on the day. 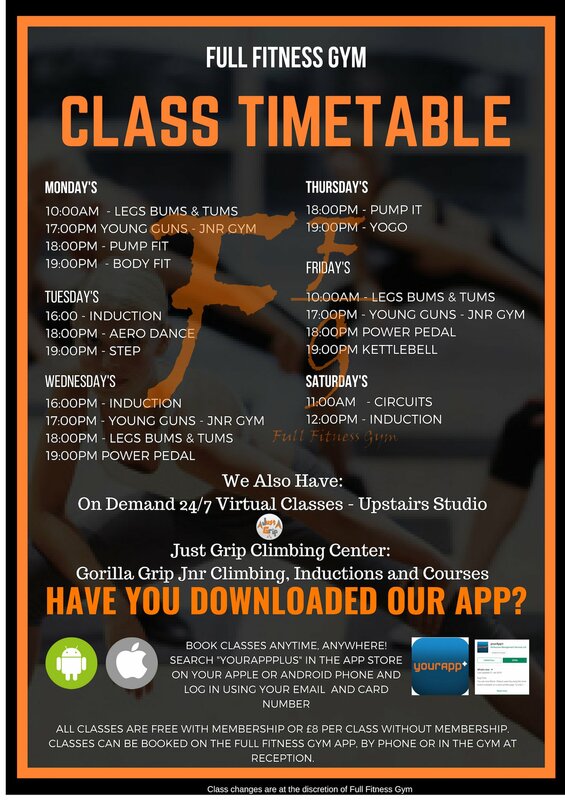 Other classes might be added at short notice, download the app and check online for the latest classes. We have these up in reception as well so keep your eyes peeled!!!! We now also have online booking for the kids classes. You will need to click on this link below and register your child. You will get a code and password emailed to you. You can then login online and book your classes. Kids classes information can be found just here. 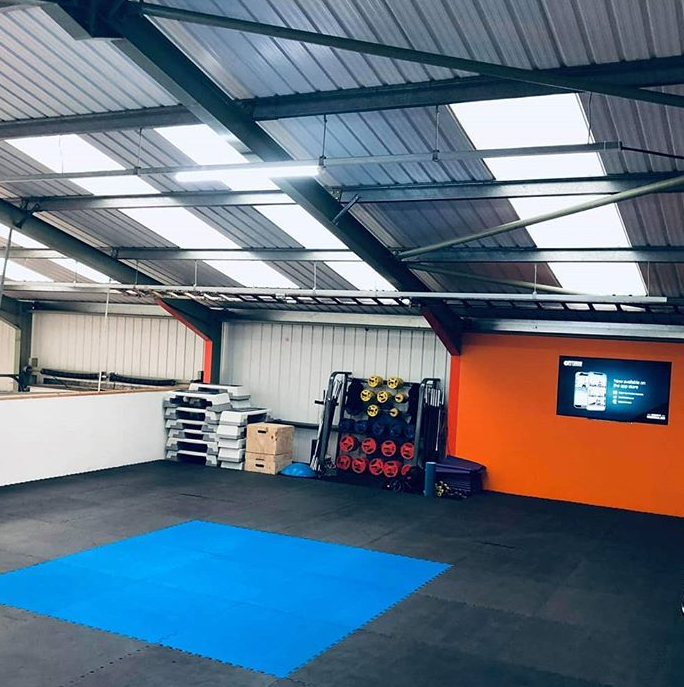 All classes at Full Fitness Gym are free. You do not need to book the classes but we do advise it to avoid disappointment. Take a look above to see the options for booking your class. Get fit, make friends and push yourself forward by booking yourself on to classes. In the studio upstairs you will find a big TV, and next to this is an Ipad. Find a class that you like with a very easy to use filter system by exercise type and time to narrow down your favourite classes. You can use these 24/7 virtual classes either by yourself or with friends whenever you like, without any instructor present.